BRACKNELL, UK. 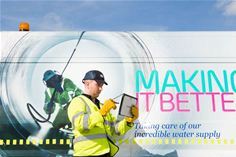 19th June 2017 Severn Trent Water has equipped its infrastructure field workforce with 1000 fully rugged Panasonic detachable notebooks to help improve operational efficiency and customer service. The water company has invested in the Panasonic Toughbook CF-20 detachable notebooks as the ideal device for use alongside its development programme for more intuitive mobile applications. The fully rugged Panasonic Toughbook CF-20 detachable notebook, which can also be used as a standalone tablet, is the primary information, reporting and communication tool for the teams as they carry out maintenance and emergency repairs to their network. The Panasonic Toughbook notebook is used to receive work instructions, review utility and infrastructure maps and reporting, including photographic evidence to accompany electronic work records. The device can also be used for Skype communications with the operations centre to help improve efficiency and customer service by providing live updates from site. Alongside the device, Panasonic recommended the use of NetMotion Wireless software to improve connectivity and productivity for the workforce when in the field. With the old devices the Field Teams were frustrated by a lack of connectivity via 3G and 4G mobile signals in rural areas and regular connection drop-outs meant that data often had to be re-inputted and more importantly the delays in updates and receiving new jobs often had a negative impact upon customer service. Chris Turner, the Utilities Sales Manager for Panasonic Toughbook, said: “Severn Trent Water was quick to realise the benefits of the Panasonic Toughbook CF-20 notebook. It’s the ideal device for this specific set of users and provides the flexibility of both a tablet and notebook in a single device without compromising on reliability or performance”. Chris, who has 12 years’ experience working for Panasonic Toughbook, has recently taken responsibility for the Utilities sector. He brings an in-depth knowledge of rugged computing and its business applications, having previously worked for Panasonic Toughbook in the areas of Defence, Field Services and the Public Sector. For the full Severn Trent Water video on the Panasonic Toughbook deployment click here: https://www.youtube.com/watch?v=NuIZdqy18p0. PSCEU is the European branch of Panasonic Systems Communications Company, the global B2B division of Panasonic. PSCEU’s goal is to improve the working lives of business professionals and help their organisations’ efficiency and performance. We help organisations capture, compute and communicate all sorts of information: image, voice, and textual data. Products include PBX telephone switches, document printers, professional cameras, projectors, large visual displays, rugged mobile PCs and fire alarms solutions. With around 400 staff, engineering design expertise, global project management capability and a large European partner network, PSCEU offers unrivalled capability in its markets. Communication Solutions, including professional scanners, multifunctional printers, telephony systems and SIP terminal devices. Visual System Solutions, including projectors and professional displays. Panasonic offers the widest range of Visual products, and leads the European projector market with 28% revenue share (Futuresource B2B market tracking, Q1/2014). Professional Camera Solutions, including Broadcast & ProAV products, security, fire alarm systems and industrial medical vision (IMV) technology. Panasonic is one of the top two professional camera vendors in Europe. Computer Product Solutions helps mobile workers improve productivity with its range of Toughbook rugged notebooks, Toughpad business tablets and electronic point of sales (EPOS) systems. As European market leaders, Panasonic Toughbook had a 67% revenue share of sales of rugged and durable notebooks and Panasonic Toughpad held a 56% revenue share of sales of rugged business tablets in 2016 (VDC Research, March 2017).